Guest post by Jos Hagelaars. Dutch version is here. Discussions on the Internet regarding climate change are sometimes about scientific details, sometimes about the climate sensitivity regarding the equilibrium situation hundreds of years from now, but the most prevalent discussion topic is probably: the global average temperature. Will it get warmer or colder, is there a temporary slowdown or acceleration in the rise in temperature, are the models correct or not, will the eventual warming of our earth in the future be large or small? New numbers are released on a monthly basis and every month megabytes of text are generated about them. My forecast is that 2015 again will lead to a discussion-spike. 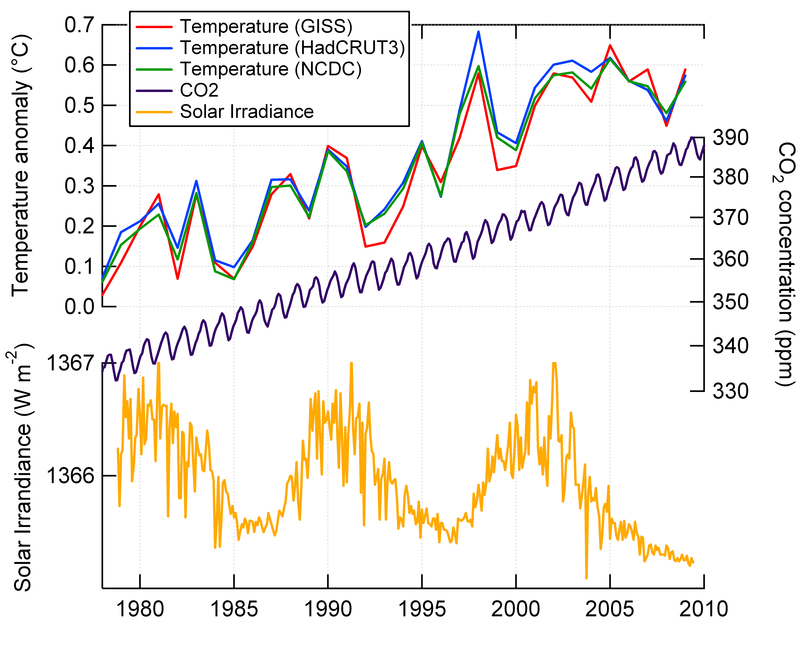 The graph above shows the evolution of the global surface temperature anomaly for three datasets, where the average of the period 1981-2010 is defined as 0. For the year 2015 only data are presented up to and including June. So far 2015 exceeds all other years and the evolving El Niño makes it likely that 2015 will set a new world record. This demonstrates is how very un-robust the “slowdown” is. While short term trends are generally treated with a suitable level of caution by specialists in the field, they feature significantly in the public discourse on climate change. The last factor means that one shouldn’t expect the multi-model mean (in which most variability is cancelled out) to be identical to the observations (which are the result of a particular realisation of natural variability). More commentary on the paper on e.g. RC (Rahmstorf), SkS (Cowtan and Way), Guardian (Nuccitelli), P3 (Tobis), Victor Venema, Neven. See also this very useful background information provided by the authors. Update: Below a similar figure as above, with different confidence intervals for the model runs shown. The big picture (or as some call it: the Wheelchair): Global average temperature since the last ice age (20,000 BC) up to the not-too distant future (2100) under a middle-of-the-road emission scenario. Earlier this month an article was published in Science about a temperature reconstruction regarding the past 11,000 years. The lead author is Shaun Marcott from Oregon State University and the second author Jeremy Shakun, who may be familiar from the interesting study that was published last year on the relationship between CO2 and temperature during the last deglaciation. 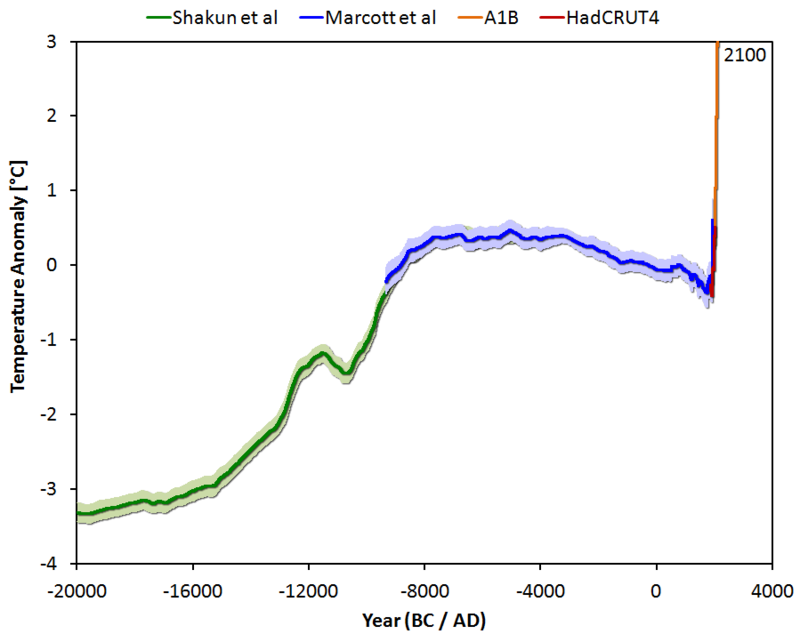 The temperature reconstruction of Marcott is the first one that covers the entire period of the Holocene. Naturally this reconstruction is not perfect, and some details will probably change in the future. A normal part of the scientific process. as an outsider to the blogosphere, it surprises me that so many people, presumably mostly with even less knowledge and training than me, seem absolutely convinced they have mastered every area of climate science. Dr Eric Wolff of the British Antarctic Survey tried valiantly to find a measure of agreement between the two sides. The greenhouse effect (however badly named) does occur in practice: our planet and the others with an atmosphere are warmer than they would be because of the presence of water vapour and CO2. 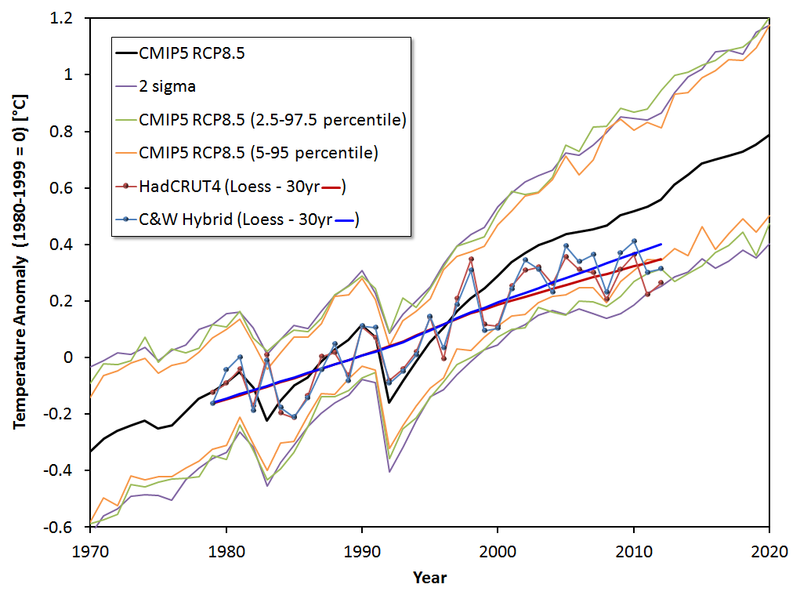 The climate has warmed over the last 50 years, [as is evident from] land atmospheric temperature, marine atmospheric temperature, sea surface temperature, and (from Prof Svensmark) ocean heat content, all with a rising trend. On sea level, I said that I had a problem in the context of the day, because this was the first time I had ever been in a room where someone had claimed (as Prof Morner did) that sea level has not been rising in recent decades at all. I therefore can’t claim we agreed, only that this was a very unusual room. However, I suggested that we can agree that, IF it warms, sea level will rise, since ice definitely melts on warming, and the density of seawater definitely drops as you warm it. I should first state the rationale for the summary I made at the Downing event. The meeting was about the science and economics of climate change, and I was asked to lead a discussion that came between the science talks and the two economics talks. I therefore felt the most useful thing I could do was to try to summarise what we had heard, as a basis for the discussion of whether society should do anything in response to that, and if so what. In particular I did hear a surprising number of things on which almost everyone in the room could agree, and it seemed worth emphasising that, rather than rehearsing old arguments. I notice in the thread here several comments about who sets the “terms of the debate”, and about the “context of the debate”. While such phrasings may make sense in discussing energy policy, it is a strange way to discuss the science. Our context is the laws of physics and our observations of the Earth in action; our aim as scientists is to find out how the Earth works: this is not a matter of debate but of evidence. I think some of the comments on this blog come dangerously close to suggesting that we should first decide our energy policy, and then tell the Earth how to behave in response to it. Regarding Plimer’s proposal that volcanic emissions were more important than we thought, (…) if volcanoes were “causing” the recent increase, then around 1800 their emissions would have had to rise above their stable long-term rate, and then stayed high. This is however a rather hypothetical discussion because the change in the isotopic composition of CO2 in the atmosphere over the industrial period is not consistent with an increased volcanic source anyway. Regarding the idea that the “temperature increase stopped in 2000”: my point is that we know there are natural variations (due eg to El Nino) that cause runs of a few years of temperature colder than the average or a few years warmer. Look on the record at the decade around 1910 for example when there was a long run of cold years on a flat background. Such a period superimposed on a trend would look like the last decade (but more so). The point of my analogy is that you can’t determine the trend over several months by measuring the gradient in a run of a few days. Similarly, you simply can’t determine a multidecadal trend by measuring the gradient over a few years because all you get is the “noise” of natural variability. Professor Morner claims that globally sea level has not risen at all; he dismisses the evidence, from both satellites and the global tide gauge network, that it has. (…) There are numerous reasons why a single site can show a sea level signal, either real or apparent, that departs from the global mean. I am not the best person to discuss models and feedbacks in detail (see comment on expertise below). However, I could not let two issues pass. 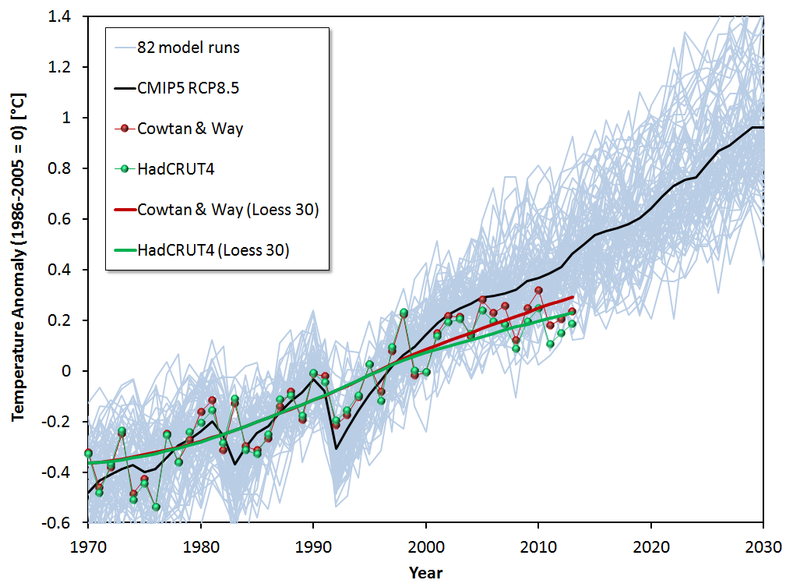 Firstly, when models are run out for a century into the future, they do indeed show runs of years with flat temperatures amidst a trend (…) (because of El Nino and other natural factors). I am therefore not clear why this is evidence that something is missing. Regarding positive feedbacks: a positive feedback implies amplification, but not a system out of control; this is only the case if the sum of the gain factors is greater than 1. Finally, a few specific issues that interested or worried me. (…) CO2 emits infrared as well as absorbing it. (…) indeed, this property is precisely why its effects do not saturate (but fall logarithmically), because it allows the height from which the emitted radiation finally escapes to rise into regions with less and less air. Geckko accidentally made an important point. S/he did not like the statement: “We can agree that if it warms the sea level will rise”, because it was too simplistic. Well, as a scientist I always like to boil things down to a statement that my brain can grasp, but that contains the essential explanation of an observation or process. And this one does, for example being demonstrably what was observed in going from a cold ice age world, with sea level 120 metres below the present level, to the present. However, you are right: there are factors that could make this statement false, such as increased snowfall when it warms, adding more ice into ice sheets. As soon as several such competing processes have to be taken into account, our brains cannot predict the outcome, and so we have to resort to putting all the “millions of assumptions” into a numerical model and seeing which of them “win”. An argument for models? Coldish made a good point about expertise, and this is where I am going to go into a slightly more challenging area. I freely admit that I am not an expert on all, or even most, aspects of climate. When I reach a topic that I have not previously studied, I go to those who are experts, either in person or by reading their work. I maintain scepticism about some of their conclusions, but my working assumption is that they are intelligent and that they have probably thought of most of the issues that I will come up with. Can I observe as an outsider to the blogosphere, that it surprises me that so many people, presumably mostly with even less knowledge and training than me, seem absolutely convinced they have mastered every area of climate science. and more so, convinced that they are right and almost all of the experts are wrong. That must be the height of hubris. However, Coldish specifically mentioned IPCC, and I think there is also an interesting point to make about that. At the Downing event, there seemed to be two IPCCs in the room. To some it was a huge plot, masterminded by some mysterious power that manipulates troublesome scientists. To me and the scientists in the room, it is (at least in WG1) simply a set of well-researched review papers, describing the present state of the peer-reviewed literature. I mention this only because I think the former view is a type of groupthink where, because people form an extreme opinion in their private space, they think it is widely held, or even true. I thought this might indeed be a chance for a civilised discussion, and some of the respondents seem happy to have that. However there are also a lot of remarks on here that are frankly rude and aggressive, and I won’t be returning. Now I remember why I hate the blogosphere. They both provide a compelling visual picture of potential future warming in the context of past temperatures. – The bottom figure includes the “constant composition” scenario (C3 in yellow), which I find a useless distraction. It has no realistic value, as it implies an abrupt and arbitrary CO2 emission reduction, but continued aerosol emissions. (Aerosol particles have a short atmospheric residence time, so emissions have to be sustained in order to keep the concentration constant. OTOH, CO2 has a very long lifetime and with roughly 70% lower emissions its concentration would remain constant). It shows the amount of unrealized warming, but it most definitely is not an (even remotely) plausible scenario, and thus should not be presented as such. 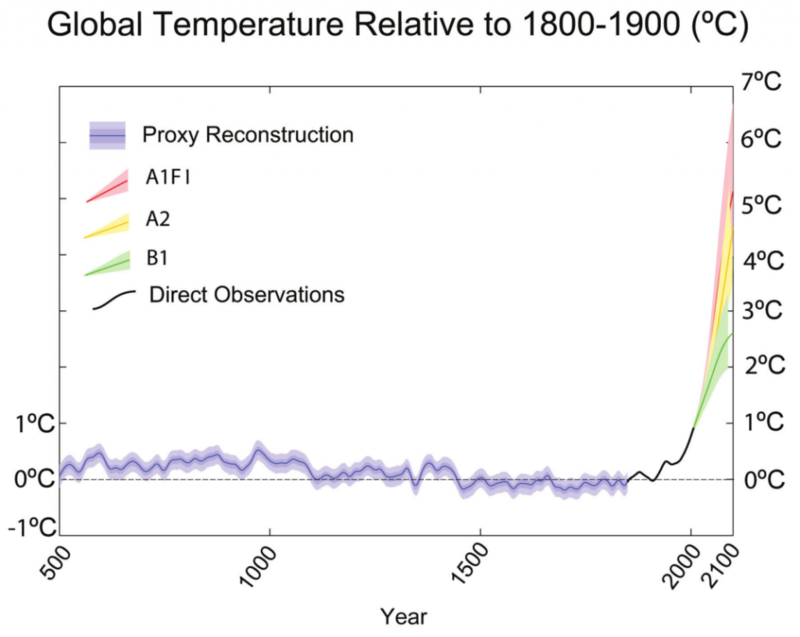 – As for the proxy temperatures going back to the Middle Ages (or even further), I prefer the (mini) spaghetti graph of the lower figure over the top figure, which features only the Mann et al (2008) reconstruction. The top figure is from the Copenhagen Diagnosis; the bottom figure from Chapman and Davis (2010). I chose to show the top graph, mainly because of the bothersome inclusion of the C3 “scenario” in the other one. 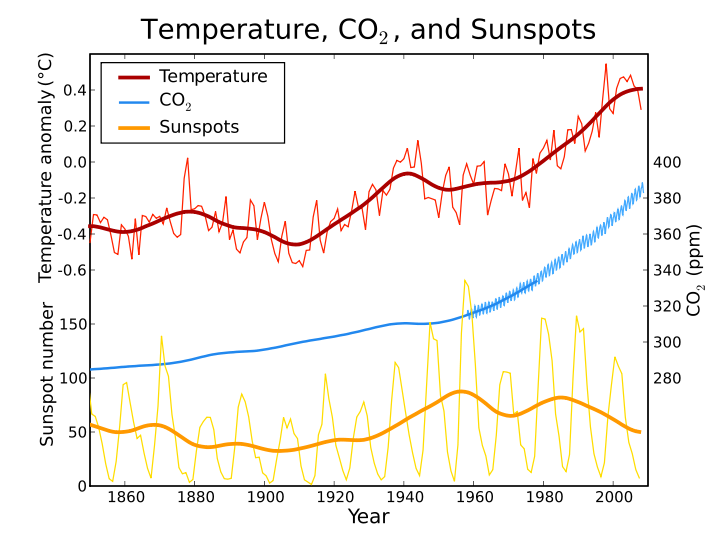 Several times in recent weeks people have commented that the sun is responsible for the current climate change rather than CO2. Ironically, this was sometimes argued by the same people who were cheering on the claim that there is no deterministic forcing at work in driving temperatures upwards (be it GHG or the sun or whatever else). So much for coherence. Temperatures jiggle up and down, but are increasing over the longer term (multiple decades). CO2 has a seasonal cycle due to the ‘breathing’ of the biosphere, but is steadily increasing over the years due to human emissions. The sun shows an 11-year cycle, but no secular increase or decrease over this time period. So what does this tell us? Of course changes in the sun affect our climate (coherence check: This implies a certain degree of determinism). Low solar activity (e.g. during the Maunder and the Dalton minima) played a role in the so called ‘little ice age’. In the beginning of the 20th century solar activity increased, which contributed to the warming (together with greenhouse gases and a lack of volcanic activity). However, since the solar output (including cosmic rays) remained steady (or even decreased a bit) since the 1950’s, it doesn’t seem very likely that the sun contributed to the recent increase in temperatures since the 1970’s. The little ice age ended (~1850) long before the recent warming started (~1975), so no causal relation there either. See also Skeptical Science and Lockwood’s recent review paper (the first chapter, describing the context of the ‘controversy’ is well worth reading). Comparisons with other surface based datasets here; with satellite data sets here; with several bloggers’ reconstructions here. 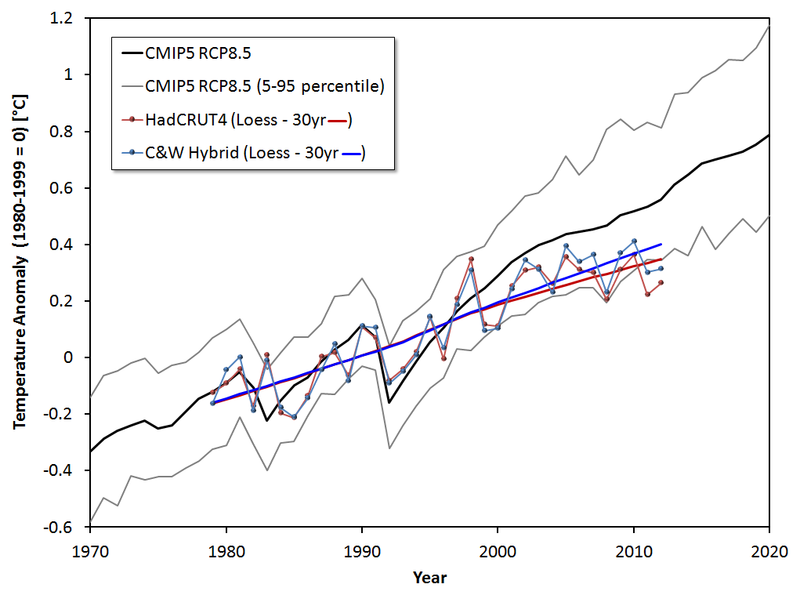 CRU’s data handling has not inflated the warming trend, see e.g. here and here. The disclosure of climate data from the Climatic Research Unit (CRU) at the University of East Anglia (UEA) in November 2009 had the potential to damage the reputation of the climate science and the scientists involved. We believe that the focus on CRU and Professor Phil Jones, Director of CRU, in particular, has largely been misplaced. Whilst we are concerned that the disclosed e-mails suggest a blunt refusal to share scientific data and methodologies with others, we can sympathise with Professor Jones, who must have found it frustrating to handle requests for data that he knew—or perceived—were motivated by a desire simply to undermine his work. We are content that the phrases such as “trick” or “hiding the decline” were colloquial terms used in private e-mails and the balance of evidence is that they were not part of a systematic attempt to mislead. Likewise the evidence that we have seen does not suggest that Professor Jones was trying to subvert the peer review process. Academics should not be criticized for making informal comments on academic papers. In the context of Freedom of Information (FOIA), much of the responsibility should lie with UEA. The disclosed e-mails appear to show a culture of non-disclosure at CRU and instances where information may have been deleted, to avoid disclosure. We found prima facie evidence to suggest that the UEA found ways to support the culture at CRU of resisting disclosure of information to climate change sceptics. The failure of UEA to grasp fully the potential damage to CRU and UEA by the non-disclosure of FOIA requests was regrettable. UEA needs to review its policy towards FOIA and re-assess how it can support academics whose expertise in this area is limited. We accept the independence of the Climate Change E-mail Review and recommend that the Review be open and transparent, taking oral evidence and conducting interviews in public wherever possible. On 22 March UEA announced the Scientific Appraisal Panel to be chaired by Lord Oxburgh. This Panel should determine whether the work of CRU has been soundly built and it would be premature for us to pre-judge its work. See also James Annan with a good dose of British sarcasm. Also Eli, Stoat. Image Nick Anderson. no evidence of any deliberate scientific malpractice in any of the work of the Climatic Research Unit and had it been there we believe that it is likely that we would have detected it. it is very surprising that research in an area that depends so heavily on statistical methods has not been carried out in close collaboration with professional statisticians. The last conclusion seems very relevant in light of the recent discussions on this blog. 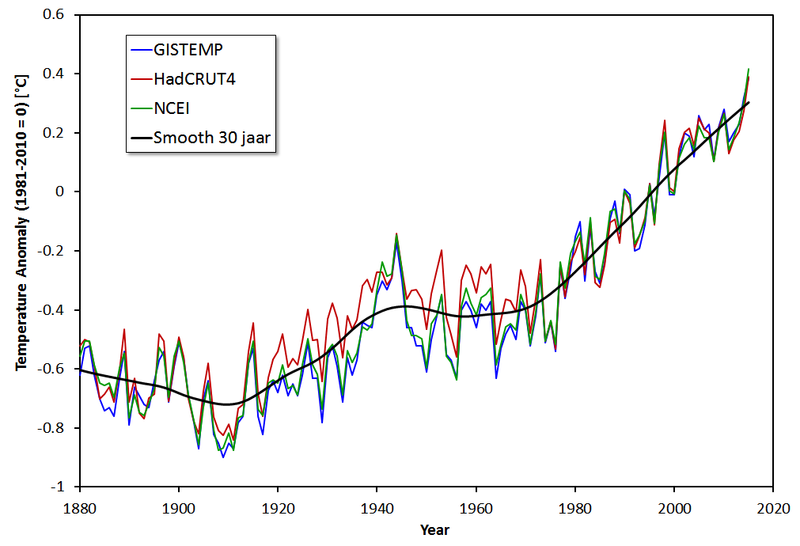 So what if the global average temperature series contained a unit root? It would mean that ordinary least squares regression may lead to spurious results in terms of inflated trend significance. It would *not* mean that phsyics-based climate models are suddenly invalid or that AGW is suddenly falsified (just as gravity is not falsified by observing a bird in the sky). I agree with you that temperatures are not ‘in essence’ a random walk, just like many (if not all) economic variables observed as random walks are in fact not random walks. “I’m not ‘disproving’ AGWH here. I’m not claiming that temperatures are a random walk. However, many commenters started chiming in with a sense of “Yeah, somebody is taking on climate science and seems to have refuted it all!” Uhm, no. Basically, a random walk towards warmer air temperatures would cause either a negative radiative imbalance at the top of the atmosphere, or the energy would have to come from other parts of the earth’s system. Neither is the case. It’s actually opposite: There is a positive radiation imbalance and other reservoirs (e.g. oceans, cryosphere) are also gaining more energy. Which makes sense, in the face of a radiative forcing. Explaining the increase in global average temperatures by a mere ‘random walk’ would violate conservation of energy. So the process of the net incoming (downward solar energy minus the reflected) solar energy warming the system and the outgoing heat radiation from the warmer planet escaping to space goes on, until the two components of the energy are in balance. On an average sense, it is this radiation energy balance that provides a powerful constraint for the global average temperature of the planet. I.e. The global average temperature only changes over climatic timescales (multiple decades or longer) if there is an imbalance in the radiation budget. As is now indeed the case. Climate is to a certain extent deterministic, irrespective of unit roots. The presence/absence of a unit root (dependent on the nature of the assumed trend amongst other choices) does not disprove/prove that the extra greenhouse gases we put in the atmosphere are warming the planet. Update: This discussion has focussed on global average air temperatures, but changes have been observed in many other parts of the earth system that point to a changing (warming) climate: Sea level rise, ocean heat content, ice sheets , sea ice, glaciers, ecosystems, radiation budget. A statement along the lines of ‘nothing anomalous is happening’ should take all these changes into account. I made some graphs of global temperature change according to the three major compilations based on measured surface temperatures: GISS, HadCRU and NCDC. 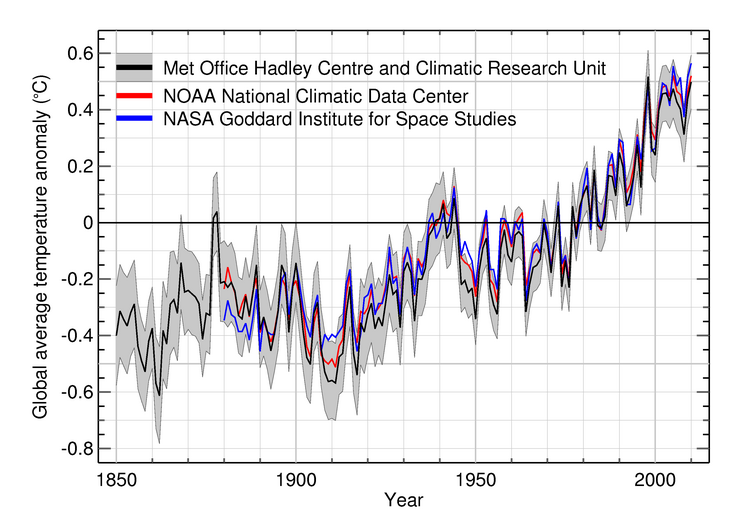 They are expressed as the temperature difference (“anomaly”) with respect to the 1901-2000 average as the baseline. Temperatures jiggle up and down, but the overall trend is up: The globe is warming. Often, the last datapoint (representing 2009) is omitted, and only HadCRU temperatures (in blue) are shown, to create the most visually compelling picture for claiming that “global warming has stopped” or even reversed (“blogal cooling”, pun intended). 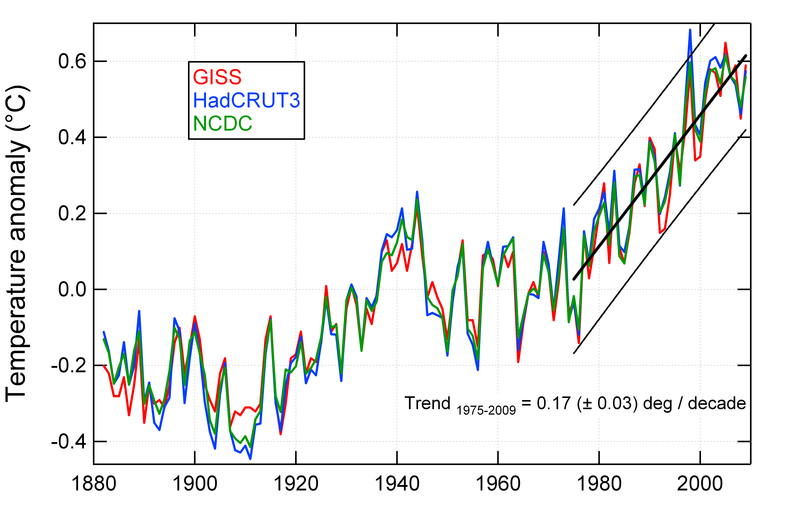 The trend over 1975 to 2009 is approximately the same (0.17 +/- 0.03 degrees per decade) for all three temperature series. The error represents the 95% confidence interval for the trend, i.e. 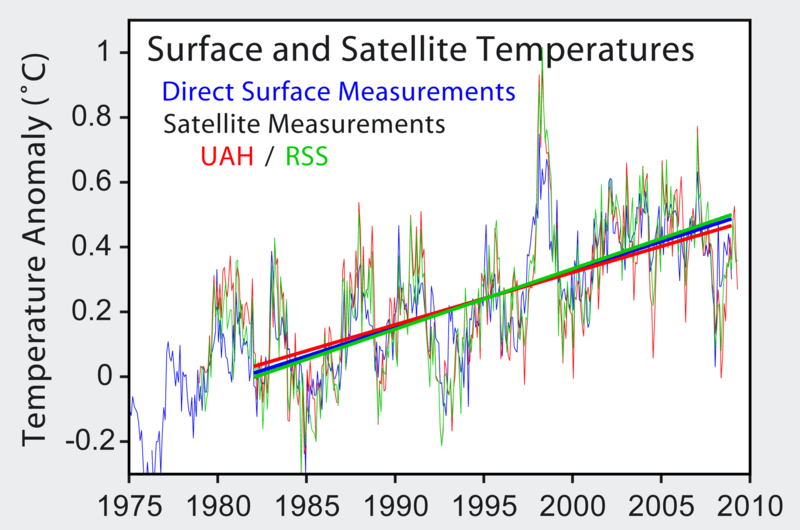 if you were to repeat the trend analysis a hundred times on the real underlying data, 95 times you would find that the trend is within the range 0.14 to 0.20 degrees per decade. The thin black lines represent the 95% confidence “predictions bands” for the data: Based on the observed variability, 95% of the data are expected to fall within these lines. The observed yearly variability in global temperatures (sometimes exceeding 0.2 degrees) is such that 10 years is too short to discern the underlying long term trend (0.17 degrees per decade). There is no sign that the warming trend of the past 35 years has recently stopped or reversed. 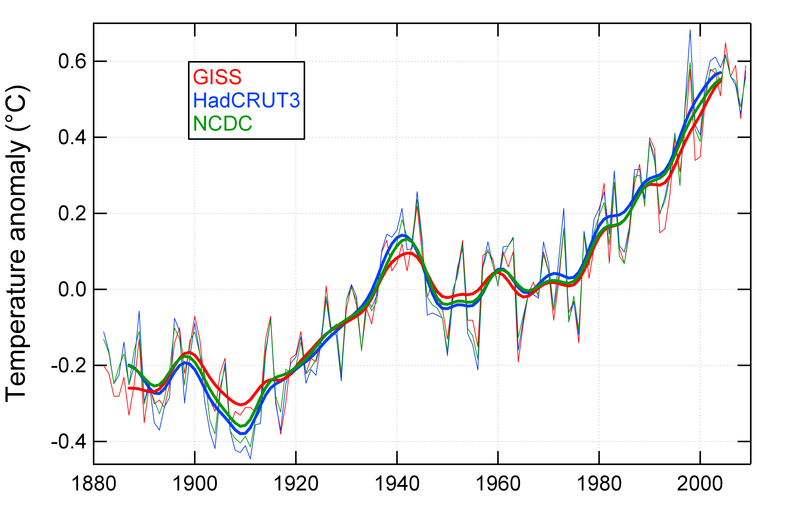 A major difference between the datasets is that HadCRU omits the arctic (in effect assuming that is warms as the global average), while GISS estimates it by interpolation. I don’t know about NCDC. 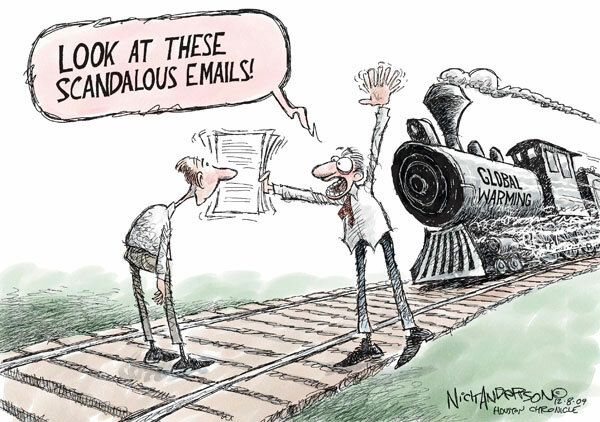 See also RealClimate and James Hansen. 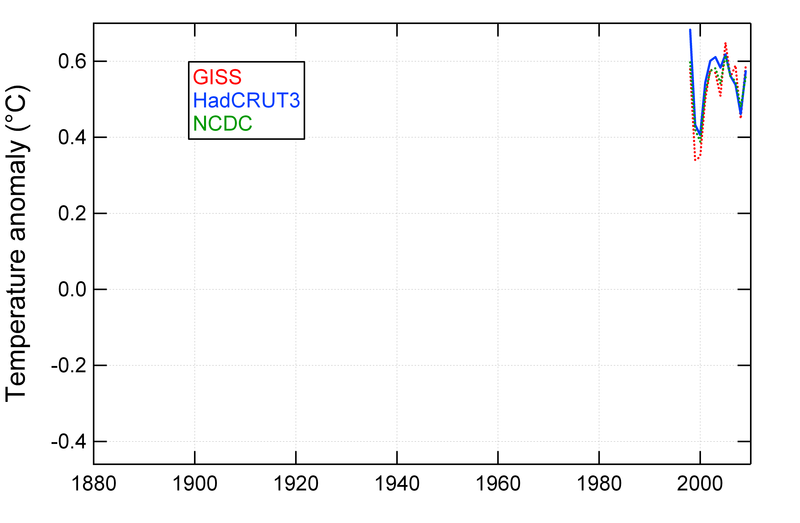 Similar analysis of GISS, HadCRU and NCDC temperatures up to 2007 by Tamino. Other nifty analyses by Tamino relating to the same theme can be found here, here, here and here. 1998 was a record warm year in large part because of a very strong El Nino event. If the effect of the ENSO cycle is removed, the warming trend becomes even more apparent, see e.g. RealClimate. Other rebuttals of the spurious 1998-claim at SkepticalScience, Coby Beck, Zeke Hausfather, RealClimate, Scott Mandia, Greenfyre (including lots more links) and Peter Sinclair of the denial crock of the week youtube videoseries. Four independent statisticians were given the data (up to 2008) and asked to look for trends, without being told what the numbers represented. Not surprisingly, they found no evidence of a downward trend. Story retold e.g. here and here. Robert Grumbine explains the art of cherrypicking and why it is not science. Update: If you want higher resolution versions of any of the figures here you can email me via the link on the right (under “pages”).